However, avid WhatsApp users will notice immediately that this new feature is very similar to a feature already existing on Facebook. Talking about this new improvement of WhatsApp, now the most successful instant messaging app in the world, a spokesperson explained: ‘The new feature makes it easy to share creative text-based Status updates. Now you never have to worry about getting the word out to all your family and friends. Whether you’re looking for vacation recommendations or notifying a group about the address for a party, the text-based status feature allows you to update your contacts in a fun and personal way. 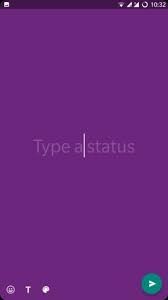 To customize text statuses, users can choose a specific font and background color, or include links‘. WhatsApp has added also another important option: the ability to see who has viewed your Status update. How? Users have simply to tap on the eye icon at the bottom of any Status update and they will be able to view the list of contacts who have seen the Status. Is WhatsApp the new competitor of the telephone companies?